From the earliest days of the Institute, women have played pivotal roles in the organisation's success. 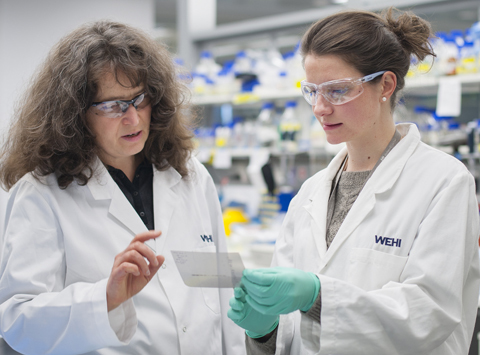 To celebrate International Women's Day, we profiled a number of these impressive #WEHIwomen who have produced breakthrough research, driven strategic growth, and helped improve health outcomes. A specialist in statistics and bioinformatics, Lyndal has developed a maths algorithm to find patterns of natural selection in malaria. She's also an AMSI CHOOSEMATHS ambassador encouraging young women and girls to consider a career in STEM. There is a lot of big data in science, using computational techniques Melissa is studying how networks of molecular interactions process biological information. She is seeking to understand the behaviour of cells in normal and cancerous tissues. Isabella uses flow cytometery to gain understanding of how epigenetic drugs influence the immune response. She has also contributed to our gender equity initiatives and provided support to our CareerTracker interns. Working with animals in research is not easy, but it’s incredibly valuable. Gill managed the animal facilities in Kew and always put the welfare of the animal first. Discovering how ‘good’ T cells supress ‘bad’ T cells has led Esther to discover a method that could revolutionise testing and treatment for type 1 diabetes. Helene began at the Institute as a research scientist, before moving into management and operational roles. Her work has included liaising between our scientists and corporate groups to coordinate delivery of high-quality services and facilities. Judith’s contributions to our Consumer Advisory Panel have enabled our researchers to enhance connections with community experiences of disease and expectations of scientific outcomes. Assisting in the development and delivery of the Institute’s vision for the future, Catherine’s experience in strategic planning and public policy facilitates improvements in our governance and administrative processes. Misty investigates white blood cells, the ‘serial killers’ of the immune system. Her work in science and the community has been recognised here and internationally, she is an advocate for women in STEMM and encourages Aboriginal students into the scientific field. Rhiannon has been living, breathing and reading science. In 2016, Rhiannon achieved her Honours in the same year as reading 366 scientific papers in 366 days (2016 being a leap year). Often called the face of the Institute, Rosie uses her extensive knowledge and experience of the organisation to help our staff, students, visitors and supporters every day. Wai-Hong is deciphering interactions between parasite and human proteins to discover new ways to prevent malarial blood stage infection. Before accounting and leadership positions in corporate business, Jane completed a double degree in biochemistry and physiology. Her path back to research has been deeply personal, providing a complex perspective on the challenges facing science and the people it effects. While completing her PhD in Jerusalem, Emanuela discovered inspiration on the other side of the world, leading to a potential vaccine. “Actuated by the desire to do something noble for the country in which her husband had met with a substantial reward for his labor,” in 1912 Eliza founded the Walter and Eliza Hall Trust, which led to the establishment of the Walter and Eliza Hall Institute for Research in Pathology and Medicine. Understanding the combination of factors in the environment, human host and mosquito vector helps malaria research. Alyssa collaborates closely with researchers conducting malaria control programs in the Asia Pacific to develop control and elimination strategies. One of the first three staff members of the Institute, Fannie was a bacteriologist in WWI and contributed to ground-breaking work in combating dysentery. A clinician/PhD student, Shereen’s research into lupus aims to understand the disease and explore treatment opportunities. Malaria field work in PNG is precisely how Leanne likes to undertake research. Her work has involved collecting blood samples from hundreds of school children, studying the natural immune responses of children in malarial zones. In the 1970s, Ora’s expertise in DNA sequencing placed her at the forefront of molecular biology. Her most significant discovery showed how a specific gene impacts the spread of cancer. Lynn has a reputation as a mentor for young scientists and a champion of the next generation of women coming into the laboratory. Emma’s research into understanding how platelets are formed has provided insights into potential treatments for patients undergoing chemotherapy. A pioneer in scientific mouse breeding, Margaret dedicated 50 years to the Institute, making significant contributions to immunology research, and was central in the successful management of the organisation. Susan has been a good friend to the Institute over many years, her fundraising efforts have greatly assisted in our work to understand how type 1 diabetes develops and in finding treatments for this life changing disease. Jane has received awards for her breast cancer research from across the world, but it’s the search for the key to improve disease outcomes that truly inspires her. Keeping one step ahead of cancer is Clare’s motivational drive. Her ambition is to apply insights fast emerging from blood models to understand solid tumours. Suzanne is an eminent molecular biologist with a record of significant achievements in immunology and cancer research. In her role as Institute director, Suzanne embraced new scientific disciplines and changed the face of the organization, securing funding for the $185 million Parkville redevelopment. Jacqui’s studies into cellular machinery at a molecular level aims to understand both how proteins transport molecules in and out of cells and how this function is regulated. Over two decades, Margaret managed our operational requirements, from official visits from the Duke of Edinburgh and Margaret Thatcher to approval for our first PC3 containment lab. Discoveries need donors and scientists; Susanne drove our award-winning philanthropic engagement program, connecting supporters with researchers. Working in a culture of collaboration and cooperation, Melissa’s interest in understanding the activation of immune cells has led to exploring cell communication pathways for cancer, infection and immune disorder treatment opportunities. As a medical researcher, Tracy clearly sees “we donate our lives and our brains to what we do, and hopefully by the time we get to the end of our careers we’ve discovered something exciting … something that patients are receiving, that is improving their lives”. Anne is and always has been obsessed with T cells, her expertise contributed to the cloning of the first recombinant CSF. Today, her role as CEO of the NHMRC means she oversees the national government research funded programs. Hailed a martyr to science, Dora’s contributions to scientific outcomes include journal articles on influenza, myxomatosis and the herpes simplex virus, as well as significant insights into scrub typhus, the disease that ultimately killed her. Driving strategic leadership, Sam implements best practice and continuous improvement to ensure our research and business practices continue to place us as leaders in our field. Heather’s academic and professional success gained her a public profile, including her collaboration with UK scientists to pioneer the use of electron microscopy to study influenza. Marnie was 27 when she discovered a ‘new’ gene; her work has progressed to help uncover genetic causes of problems including late miscarriage and muscular dystrophy. Working closely with clinician researchers to examine genetic disorders, Melanie develops new methods to analyse complex data, producing software that is freely available to others and thereby aiding many research fields. After years of painstaking investigation, Anne discovered a human protein that has had a huge impact on our understanding of cell biology. This knowledge has led to potentially powerful cancer treatments. Sara’s studies into mosquito biology and parasitology have led to managing and developing our insectary. Her work enriches our malaria research program, working with scientists here and globally. Optical microscopy has become one of the most powerful tools in medical research. As head of the Institute’s Centre for Dynamic Imaging, Kelly’s expertise in advanced microscopy is helping scientists visualise biological mechanisms in unprecedented detail. From a background in molecular endocrinology research and working with the NHMRC, Julie leads our reputable Research Grants Office.